The Young Clementina by D.E. 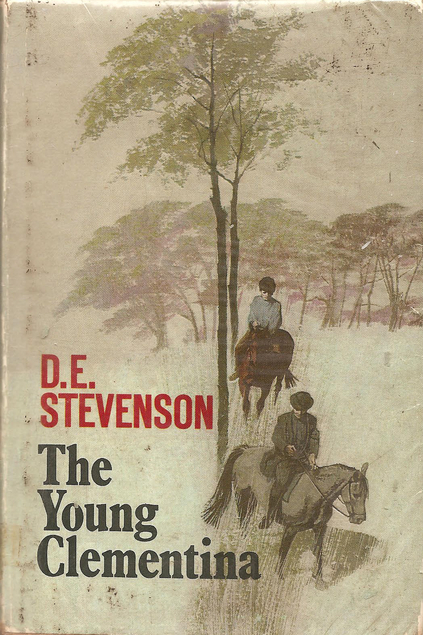 Stevenson was first published in 1935 and the story is told in three parts. It’s told by Charlotte who is working in a library in London which isn’t exactly heaving with life and fun. She’s really very lonely and scrapes along on very little money, it’s all very different from what she expected from life when she was younger. She had been engaged to Garth and so had been destined to be the ‘lady of the manor’ but Garth had to go off to World War 1 and when he came back he was a very changed man. A lack of communication from both sides leads to the end of their relationship, but twelve years down the line Garth comes back into Charlotte’s life, asking her if she will go to live in his home to look after his young daughter who is Charlotte’s god-daughter, while he goes off exploring. Charlotte is in two minds about it, mainly because she knows that after a year or so of comfort and servants in beautiful surroundings she will find it much more painful to return to her dismal poverty stricken existence. Charlotte eventually discovers what had changed Garth’s attitude towards her and there’s a happy ending. 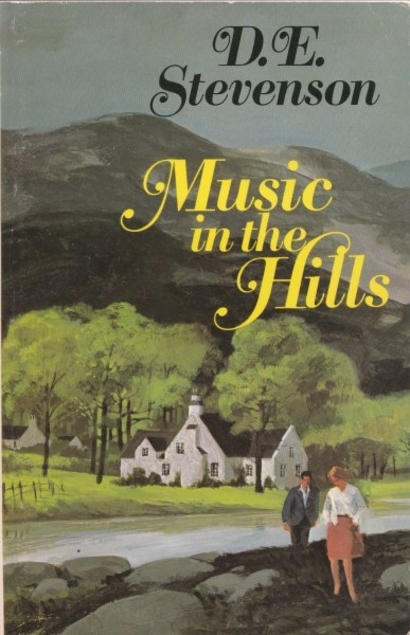 I really enjoyed this one which has a good mixture of mystery, romance, lovely rural descriptions and social commentary with the ludicrous situations that couples had to get into in order to get a divorce back in the 1930s when the book was written. Attitudes change over the years, however I was absolutely shocked when a male character in this book in all seriousness declared his love for a thirteen year old girl, the man was much older, old enough to be the girl’s father. But Charlotte wasn’t fazed at all and just asked him to wait four years!! Had I been Charlotte I would have beaten him off with a brush! In fact I might have informed the police. How times change. D.E. Stevenson was of course a Scottish author and Robert Louis Stevenson was her second cousin. Music in the Hills by D.E. 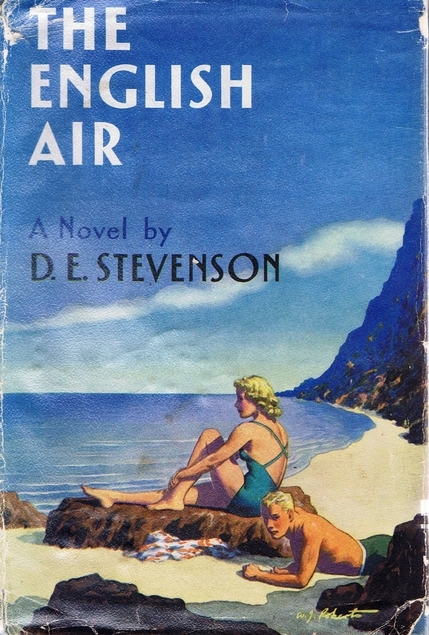 Stevenson was first published in 1950 and it’s the sequel to Vittoria Cottage. The setting is the Scottish Borders, not any specific town apparently but I imagine the countryside as being like that around Stevenson’s beloved Moffat. James Dering has been in Malaya, chasing bandits for some years and he’s glad to get back to Scotland. He has made his way to Mureth where his Aunt Mamie and Uncle Jock have a farm. James is thinking about becoming a farmer too, he loves the countryside and animals but he’s not sure if he’ll be good at farming. James had spent some time in London before making his way to Murath, but his romance with Rhoda an aspiring artist had ended badly and he is nursing a broken heart. Will the change of air heal him, or at least help him to discover what he wants to do in the future? With a cast of couthie characters this is a bit of a comfort read although not everyone or everything in the neighbourhoods of Murath and Drumburly is sweetness and light. Aunt Mamie is perfect though, although she wouldn’t agree with me about that. She envies the way others can talk with ease to strangers and acquaintances, she feels too shy and knows that she’s often seen as being a bit snooty. A lot of readers know that feeling I suspect! I realised recently that the reserve stock books in Fife’s libraries are now available to borrow after being unavailable for a few years due to the refurbishment at Dunfermline, so I requested a couple of old D.E. Stevenson books from the catalogue, I’m not sure if they have been reprinted recently. She was of course born in Edinburgh and was related to Robert Louis Stevenson. The librarian seemed quite amused that I was borrowing these books – more fool her! The English Air turned out to be a great read, first published in 1940. The setting is mainly England although the story does take us to Scotland a few times and to Germany briefly. Sophie Braithwaite is a well-off widow, living in a house big enough to allow her brother-in-law to inhabit his own wing. She has a grown up daughter and son and they’re waiting on Sophie’s sister’s son Franz to arrive, he is half German and has been brought up by his father in Germany, his mother died young. It’s 1938, a time when Neville Chamberlain was going backwards and forwards between London and Munich, trying to avert war. He was criticised for this ‘appeasement’ but in reality it gave us breathing space and a year to ‘tool up’ for war. Something that Nazi Germany had been doing for the previous five years. I really enjoyed The English Air, Franz becomes part of his cousins’ social group, their sense of humour is often a mystery to him, he’s really very German as you would expect, especially as his father is a Nazi. But as Franz becomes more comfortable in the free and easy atmosphere of Britain he begins to see the advantages of not having to look over your shoulder all the time as Germany is being ruled by fear and violence. I suppose this is a bit of propaganda, the lesson being that not every German is a bad German. It’s not surprising that writers all wanted to write their own book about the beginnings of the war. I seem to have been reading a lot of them recently and bizarrely I always find that scenario to be a bit of a comfort read, this is one of my favourites by D.E. Stevenson so now I’m keen to read her other wartime books. The other one of hers that I borrowed was Vittoria Cottage, published in 1949. I’ll be chatting about that one soonish.